Mountain goat droppings are easily confused with deer and sheep. However, the sizes of goat droppings are smaller than these other hoofed animals. Depending on the amount of moisture in the goat's diet, their droppings may vary from dry, hard pellets (winter) to a clustered mass of soft pellets. Mountain goats rely on the security of their cliffy territory for protection. Approaching within shooting range is not difficult if the hunter is able to negotiate the terrain. When possible, it is usually best to approach from above as goats are more alert to possible danger from below. Both billies (males) and nannies (females) have horns. Billies and nannies look similar. It is legal to shoot nannies; however, wildlife managers encourage hunters to target billies instead and tools have been created to help hunters to tell the difference. See the Mountain Goat Identification Quiz for more information. 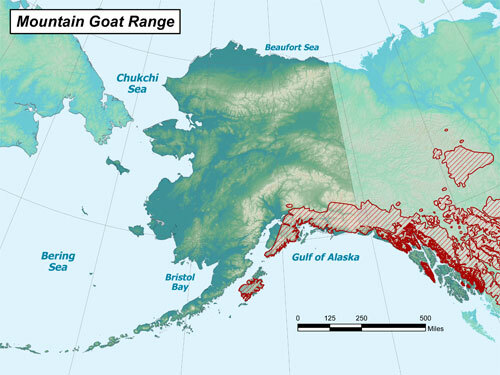 In 2007, 518 mountain goats were harvested in Alaska, 158 by nonresidents (about 30 percent) and 360 by resident hunters. Nonresident mountain goat hunters are required to have a guide or be accompanied by an Alaska resident who is a relative.